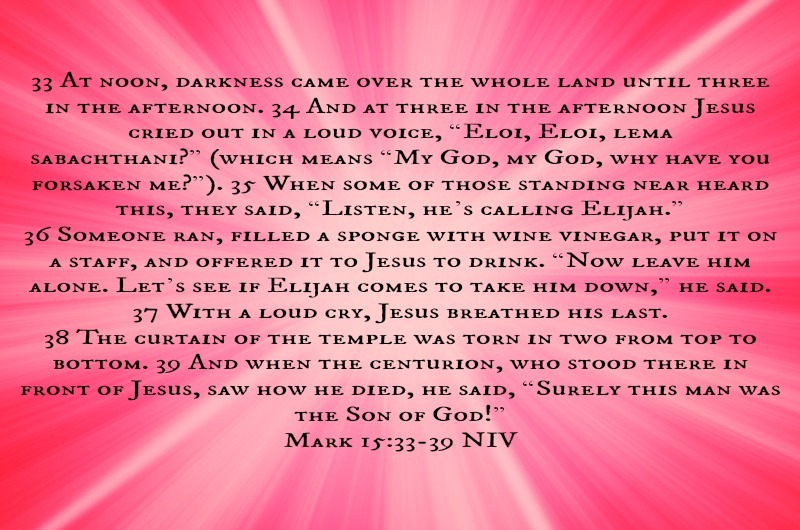 Here we see the events beginning to unfold, all that Jesus had been telling them is now happening. Let’s start with the kiss of betrayal. Everyone knew who Jesus was upon site especially to those who sought to kill Him. So why would Judas arrange a signal with them? Why a kiss? In the darkness of night, they did not want to arrest the wrong person and those that were with Judas were not the chief priest and elders themselves. It was an armed crowd(most likely temple police) that was sent by the chief priest and elders. The kiss itself was the signal to ensure that the correct person was arrested. 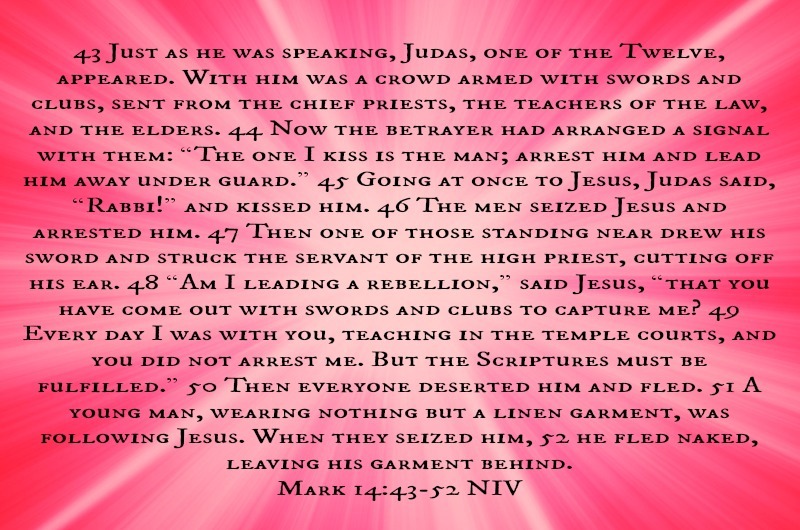 Plus it was not uncommon for a student to greet his teacher with a kiss, as we see here and in the other gospels Judas approaches Jesus and calls Him Rabbi, which means teacher. All of this had to take place so that the scriptures would be fulfilled. From here everything begins to escalate. His disciples were afraid and ran away. The trials are underway, Peter’s foretold actions become a reality for him. Take notice to who was questioning Peter as to who he was, a servant girl. Notice at what the degrees of Peter’s responses are. His first response is casual and almost like acting dumb. Then his second response followed by his third and final response shows more intensiveness of a response. 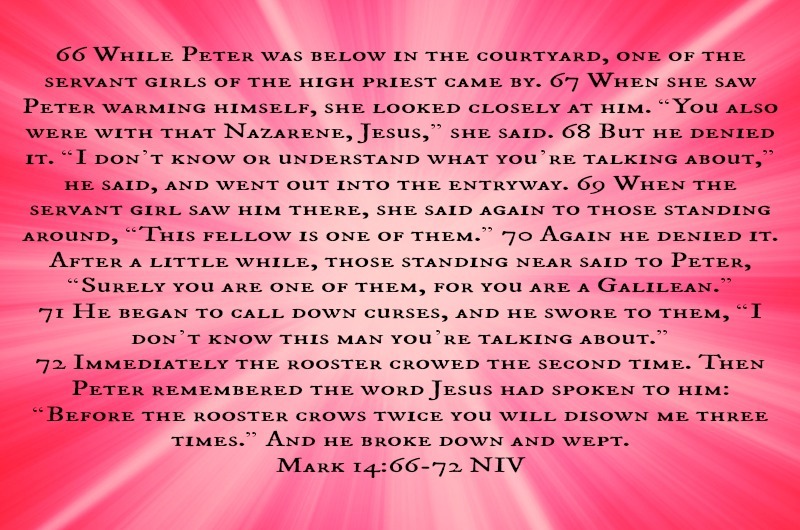 To be followed by the rooster crowing then Jesus turns and looks at which breaks him down to his reality. He remembered the words spoken to him and he weeps bitterly. But isn’t Peter’s responses like ours, when we have been pointed out for our sin. At first, we are nonchalant about it. We may say something like, “Not me. I don’t know what you are talking about.” The continued acknowledgments of it seems to fuel a burning in our souls until we lash out in complete denial, then God convicts our soul and we realize what we have done and weep bitterly in confession to God asking for forgiveness. Jesus is then taken before Pilate, who offers up freeing Jesus or Barabbas (a known murderer). The chief priests stir up the crowd into the response of releasing Barabbas and shouts of “Crucify Him!”. The very crowd that just a few short days ago was shouting out “Hosanna”. Jesus is led out to be mocked, whipped and beaten in unimaginable, barbaric ways as prophesied in scripture. Then Jesus is brought up to Golgotha, to be crucified. Here they continue to mock Him, they stripped Him of His clothes and gambled them away. Painting a picture that is far more unimaginable and conceivable in my mind, that just brings tears to my eyes every single time. With all the tears aside that I can’t stop from flowing. When Jesus commit His Spirit into the hands of God, a marvelous event occurred that is best described in Matthew. To us who have accepted our gift of salvation, these occurrences at the spontaneous time of Jesus dying is completely significant. The significance of this passage is a tearing away of the old covenant of God with His people and brings in a New covenant through Jesus death and resurrection. This new covenant was not only for the people of that time but for us as well. We enter into this covenant when we believe in faith, confess that we are a sinner and ask God to forgive us and accept Him as our personal Lord and Savior. 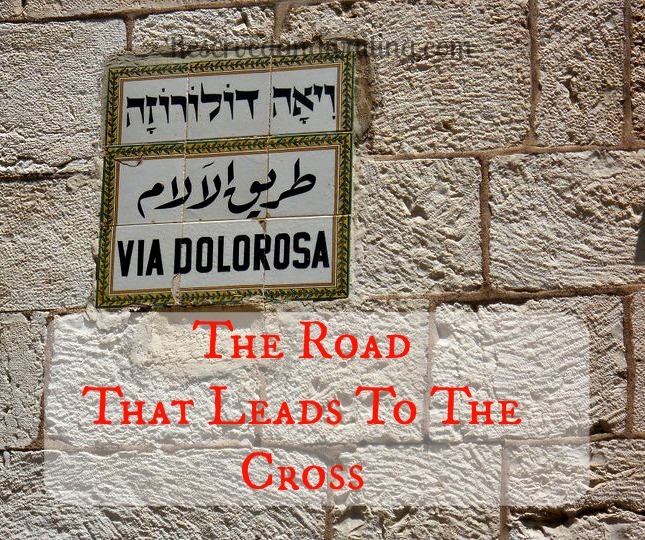 Dear fellow travelers, the road that we have been traveling does not end here at the cross. Praise the Lord!! I hope you will continue on our journey for the next two days. As we discover more of the redemption story.